The Bolshoi Theater (Russian: Большой театр, Bol'shoy Teatr, Large Theater) is a theater and opera company in Moscow, Russia, which gives performances of ballet and opera. The theater was home to the Ballet of the Moscow Imperial Bolshoi Theater. During its early years the Bolshoi in Moscow was overshadowed by the Imperial (after the Russian Revolution of 1917, the Kirov Ballet), but during the Soviet era it grew in importance as the center of power shifted from Saint Petersburg to Moscow, and even some of the dancers from the Imperial Ballet joined the troupe at the Bolshoi Ballet. The Bolshoi has been home to some of the world's greatest dancers and directors. Russian ballet and opera have produced some of the great cultural high points in world history. The name comes from the Russian word, Большой "Bolshoi," which means either "large" or "grand." 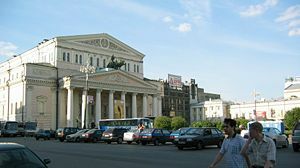 In Moscow and St Petersburg, there were only two theaters, one of them intended for opera and ballet (these were known as the Bolshoi Theaters) and another one for tragedies and comedies. As opera and ballet were considered nobler than drama, the opera house was named the "Grand Theater" and the drama theater, or "Small Theater" was known as the "Maly" theater (Малиый "Maly" is the Russian for "little"). During the Imperial era of Russian history, St. Petersburg was the most important cultural center. The Imperial Ballet School in Saint Petersburg first opened in 1738. It later became known as the Vaganova St. Petersburg Academy. The first Bolshoi Theater was the Imperial Bolshoi Kamenny Theater in Saint Petersburg. It stood next to the Circus Theater (rebuilt in 1860 as the Mariinsky Theater), but it was replaced in the 1890s by the present-day building of the St. Petersburg Conservatory. It was at St. Petersburg's Bolshoi that the first great Russian operas, Glinka's A Life for the Tsar and Ruslan and Lyudmila, were premiered. The Bolshoi company in Moscow was founded in 1776 by Prince Peter Urussov and Michael Maddox. Initially it gave performances in a private home, but in 1780 it acquired the Petrovka Theater and began producing plays and operas. The current building was built on Theater Square in 1824 to replace the Petrovka Theater, which had been destroyed by fire in 1805. It was designed by architect Andrei Mikhailov, who had built the nearby Maly Theatre in 1824. At that time, all the Russian theaters were imperial property. The Bolshoi Theater built in Moscow was originally called the Imperial Bolshoi Theater of Moscow. The theater was inaugurated on January 18, 1825. Initially it presented only Russian works, but foreign composers entered the repertoire starting from 1840. A fire in 1853 caused extensive damage; reconstruction was carried out by Albert Kavos, son of Caterino Kavos, an opera composer, and reopened in 1856. During World War II, the theater was damaged by a bomb but was promptly repaired. The Bolshoi has been the site of many historic premieres including Tchaikovsky's Voyevoda and Mazeppa, and Rachmaninoff's Aleko and Francesca da Rimini. At the Bolshoi Theatre School in Joinville, Brazil. The Bolshoi has been associated from its beginnings with ballet, and is home to the Bolshoi Ballet troupe. 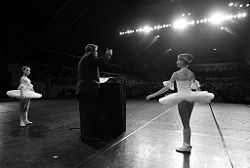 Many of the world's great ballets have played there, including a number of important premieres, such as Tchaikovsky's ballet Swan Lake which premiered at the theater on Saturday, March 4, 1877. The Bolshoi was also the site of the premiere of the great French director, Marius Petipa's, production of Don Quixote, a Grand Ballet in 4 Acts-8 Scenes, with music by Léon Minkus. It premiered on December 14, 1869. Later Alexander Gorsky, once Premier Danseur to the Imperial Ballet, staged a new version of this work for the Moscow Imperial Bolshoi Theater in 1900, with additional music composed by Anton Simon, including the Variation of the Dryad Queen from the scene of Don Quixote's Dream (AKA The Garden of Dulcinea or The Kingdom of the Dryads) that is still retained as part of the ballet's performance tradition (later added by Rudolf Nureyev to be danced by Margot Fonteyn in the Le Corsaire Pas de Deux in 1961). The main Bolshoi is currently closed for restoration work. The New Bolshoi theater, adjacent to it, continues to stage an extensive repertory of concerts and performances. Theatre Square in Moscow. The quadriga above the portico was sculpted by Peter Clodt von Jürgensburg. Berezkin, V. I. Artists of the Bolshoi Theater (In Russian). Moscow, 1976. All links retrieved June 15, 2016. This page was last modified on 15 June 2016, at 19:28.